Whenever Brad and I head out to dinner, if we’re getting drinks, Coca-Cola® (or Diet Coke) with Bacardi Rum is our go-to drink. They are simple to make, and taste consistent across different restaurants. 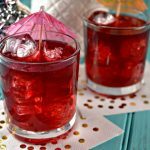 While the standard cocktail is easy to make, and delicious by itself, adding a bit of flavor through infusion is a great way to upscale this classic. So many flavors go great with the classic rum & Coke. Some of my favorites are cherry, lime, and vanilla. (Side note, if you are ever at one of the Coke Freestyle machines – try the combination of 2/3 Cherry-Vanilla Coke Zero with 1/3 Lime Coke Zero – amazing). 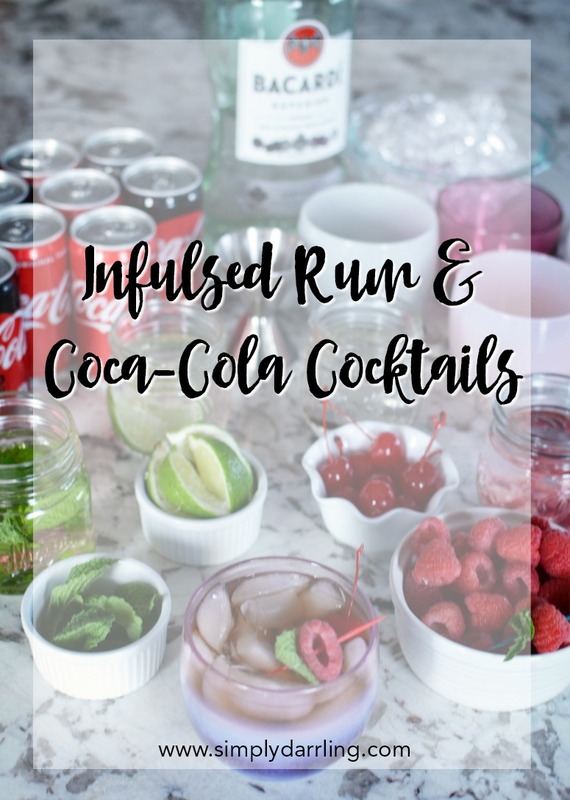 Infusing these flavors into the Rum & Coke is an easy way to add flavor into the cocktail, without added ingredients. 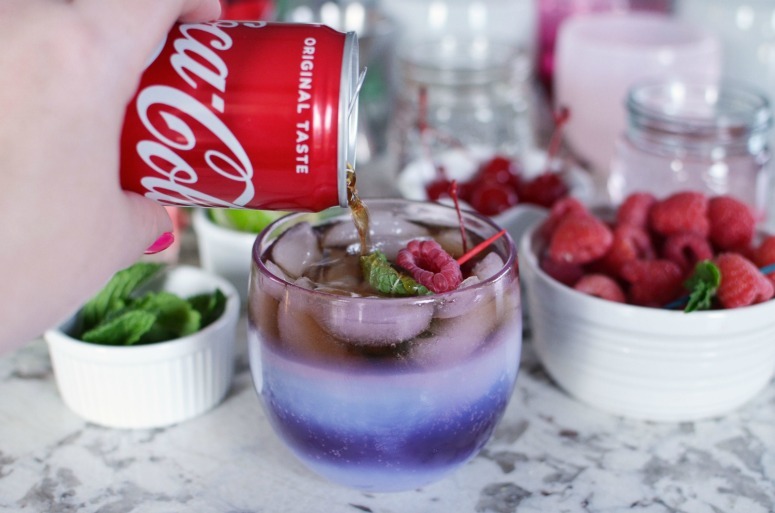 I decided to test out an infused rum & Coke bar for upcoming summer BBQs, and it is definitely something that will be making a return appearance. The Coke mini cans are the perfect size for summer BBQs. Plus, if they are looking to add a bit of kick to their drink, each person can use their can to make a wonderful flavor pairing. 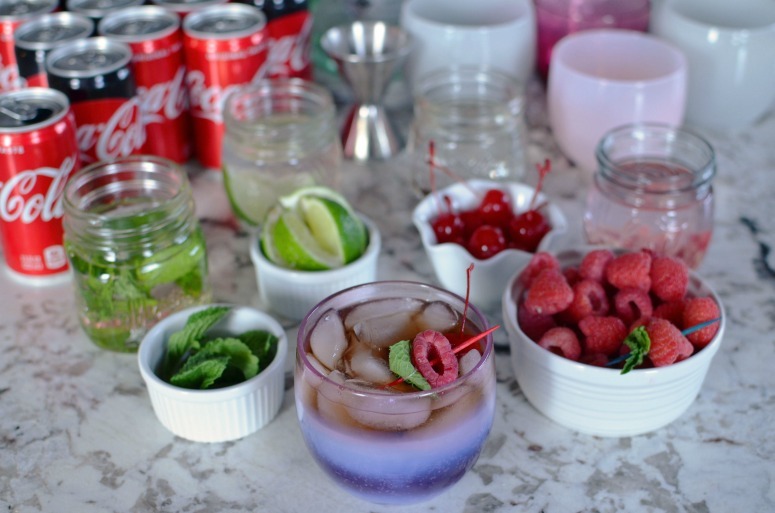 For this Rum & Coke Bar, I decided to feature mint, vanilla, lime, and raspberries for the infusions; and mint, limes, cherries, and raspberries for the accompanying garnishes. For the infused Bacardi rum, I put each item into a small mason jar, then muddled it before topping the jar off with rum. The flavors will begin to infuse pretty quickly; however, leaving them overnight in the fridge would be ideal. 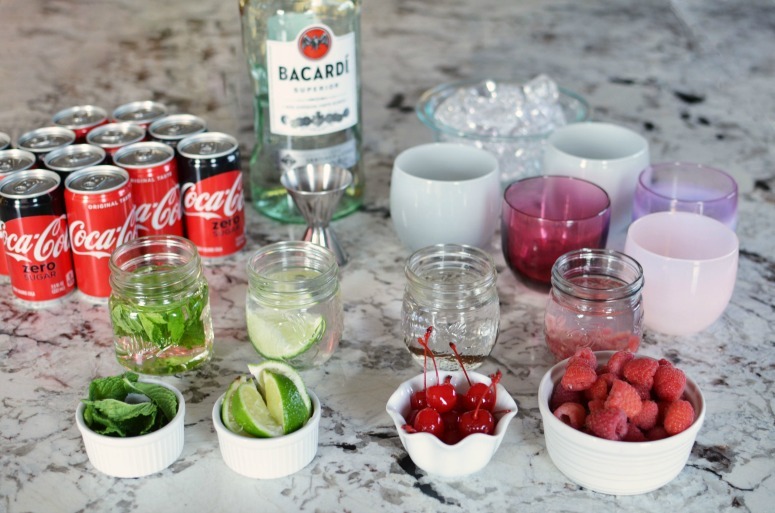 Bacardi rum is ideal for this cocktail bar because it has such a light, and versatile flavor. 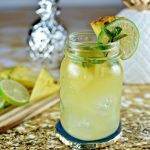 There is a reason why Bacardi is the world’s most awarded rum, is featured in many of the most popular drinks – because it is delicious and can be mixed so easily in cocktails. 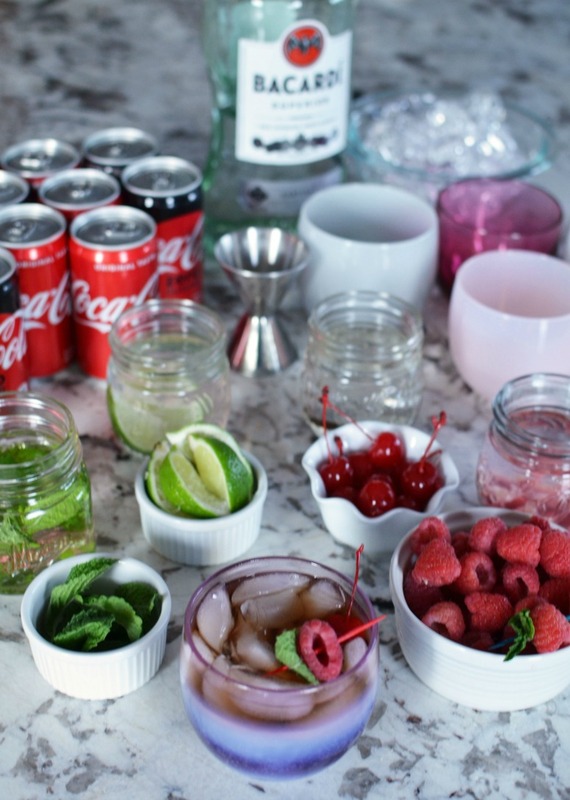 A tip for making the perfect Bacardi & Coke – pour the rum into the glass first, and then top with the Coke. 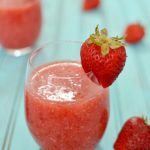 It will naturally mix together, and need less stirring (I try to avoid over-stirring cocktails with pop as it makes the fizz go crazy). 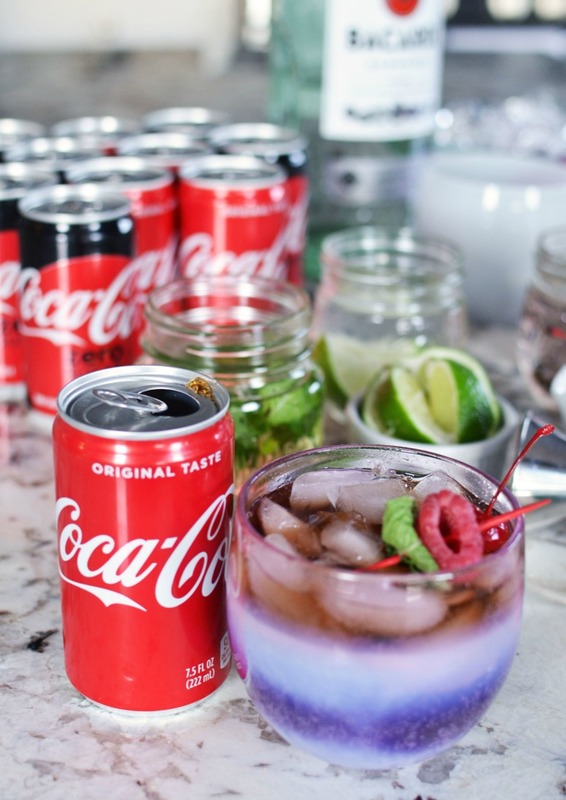 Hosting an infused Bacardi & Coke bar at a summer BBQ would be a great “signature drink” for the event. 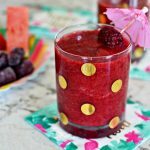 Each person can customize their cocktail to their taste, and the host can enjoy the party without having to also play bartender. I’m looking forward to trying out some other infusion flavors this summer as other items come into season. What infused rum flavor would you want to try? It just looks so pretty! Is that weird to say about a drink? haha. Nothing better than an icy rum and coke! Sounds good right about now! This is looks like something my husband would love. Wanna make it for him next time we’re together??? Rum & Coke variations are my favorite! These sound perfect for my party this weekend!